Oh, YUM! This Pumpkin Bread with a Pecan Coated Brown Sugar Glaze is yet another recipe I found over at The Country Cook and it is delicious (and surprisingly easy to make, too)! With the cool weather upon us and Halloween on top of us, I was in the mood for something pumpkin-y. This recipe jumped out at me and became one of those "try RIGHT NOW" recipes. I didn't want to save it for later and forget I had it. I must say I was a little worried the bread would fall after rising to a perfectly rounded mound, but it didn't. The brown sugar glaze should be added slowly or in increments to avoid having half of it spill over the sides of your pan. I managed to keep most of it on the bread. The pecans are optional but I love nuts. I even considered adding some to the batter but I think if I do that, I'll need to make 2 loaves instead of just one. The "Pickles" had a nibble of the bread with their breakfast this morning. They were a bit leery to try something called "pumpkin bread" (are they really that sheltered?) and kept calling it banana bread instead. It received thumbs up from both of them and The Girl even took some to school for her morning snack. Hop on over to The Country Cook to get the recipe. She even has a printable version available for you to download. On another note, I feel very justified in showing Brandie over at The Country Cook some extra link love. 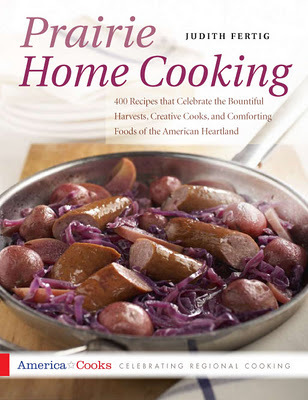 Not only have I found a wealth of fantastic easy recipes on her blog that my family loves, but I was also fortunate enough to win a copy of Prairie Home Cooking in a recent contest she held! I know what I'll be reading for the next couple of weeks! I first thought "what an odd name", but for a recipe as versatile as this, you can't really call it anything else. The cookies are exactly what the name says - cake mix and cream cheese - with a few other staple items thrown in. I found the recipe on justapinch.com (I finally clicked on the Facebook ad that kept popping up in my sidebar). The nice thing for me is, I can use it to whittle down my rather large stash of cake mix in the pantry. I keep plenty of cake mix on hand for making the cakes found on my Creative Cake Maker blog. But sometimes, I have a lot of cake mix available that needs to be used up before it goes bad. This cookie recipe is the perfect solution. Stir in any add-ins - I used 1 cup of Craisins and 3/4 cup of Macadamia nuts with a white cake mix. Another time I used an entire 12oz bag of mixed chocolate and peanut butter chips and 1/4 cup of walnuts (it's all I had) with a devil's food cake mix. Use a cookie scoop to drop Tablespoon sized balls of dough about 2 inches apart on the cookie sheet. Flatten the dough with the palm of your hand. I made the first batch without flattening them and they cooked up like mounds of cookie. They were cooked through, but I wanted a flat "cookie" look - not a mound. Bake for 16 minutes. The original recipe I used said 10 minutes but mine needed 16. I don't know if the altitude has anything to do with it? I was able to move them to a cooling rack almost immediately with no breakage. The resulting cookie is crispy on the outside, soft (not chewy) on the inside. They are more cakey than I'd prefer. I liked the devil's food cake cookies better than the white cake cookies. So did The Boy. Mr. LH and The Girl both preferred the Craisin cookies better but we already have a cranberry cookie recipe everyone likes better. Every year, we carve a pumpkin, but every year I bypass roasting the seeds. I have only roasted pumpkin seeds once before - when The Boy was still a baby. Although Mr. LH and I enjoyed them, Elder Boy didn't seem to care for them (and The Boy was too young to try them) so it was never a priority for me to pick out the seeds from our pumpkin goop to roast them. This year, while carving our pumpkin, I mentioned roasting the seeds and The Girl (with her hands playing in the goopy pumpkin innards) perked up with curiosity. She wanted to try them and patiently picked out every last pumpkin seed for me to roast. and the following day, while the "Pickles" were outside playing in the snow, I roasted them. I mixed the seeds with a small bit of vegetable oil, spread them out on a baking sheet lined with foil, sprinkled them generously with garlic salt (you could also use plain salt, kosher salt, sea salt, seasoning salt, etc) and put them in the oven at 300 degrees for about 30 minutes (stirring halfway through the baking process). I'm sure there are other ways to make them, but I was winging it. The seeds tasted very good. I ate a couple handfuls before the "Pickles" even got a chance to try them. The Girl said they were "okay good" (at first she said they tasted like fried chicken skin...) and The Boy gave them a thumbs up! After a long 24+ hour period of drying, we were able to take a break from playing in the snow to paint our paper mache sculptures. They were hard as stone and even resembled stone sculptures. I completely covered the dining room table and handed The Girl paints and brushes and left her to do her thing. WOW! She really amazes me when she takes her time to complete a project! I came back to the dining room to find the top half of her wolf looking wonderful! Once the top dried, I flipped it over for her to paint the bottom. Then I started to paint my pumpkin. It looks pretty rough, but still pumpkin-y (grin). We also had a couple of bats I shaped at the last minute and dried in the oven. The Girl loves her paper mache wolf and said she definitely wants to do this again! I guess with Halloween just around the corner, the local news stations have been showcasing area ghost towns and historic haunted places. Ghost stories have always interested me. A trip to the NC Outer Banks spurred an interest in the areas ghosts, lighthouses and sunken ships. The same thing happened when we took a trip down to Charleston, SC. But I suppose where there is history, there are bound to be ghost stories. I didn't even realize when we moved to Colorado that this state is home to the Stanley Hotel, the inspiration for the eerie hotel in Stephen King's The Shining. I love Stephen King novels. He has definitely earned the title "The King of Horror". I have not read the book, but I have watched The Shining...once. That movie, probably more than any other, freaked me out. I think it was the kid. To this day, if Mr. LH wants to spook me, all he has to do is start saying "Redrum". Even thinking about the movie sends chills up my spine. The hotel is absolutely gorgeous. Rooms are available for anything from $129 to $360 depending upon the room size and day of the week but make your reservations early - especially if you are planning a weekend stay. The hotel is old - over 100 years old - so keep that in mind when you visit. There is no AC in the rooms and the heat (from reviews I have read) is not very well regulated. But the service (once again from reviews) is superb! I won't stay there. I refuse to stay overnight anywhere that is even thought to be haunted. My mind would get the better of me and I'd never get to sleep. Especially in an old building that (even naturally) has creaks and groans. I sure wouldn't mind taking a ghost tour, though. We may have to wait until next summer. But once again, if you decide on the tour make that reservation early - the hotel recommends making tour reservations (which are required) at least one to two weeks in advance. Now an author has written a book about the hotel and her own experiences there called The History and Haunting of The Stanley Hotel (the link will only take you to the news clip with the author - not the book itself). I believe I might have to check this book out at the library and read up on the Stanley Hotel. It's hard to believe after such a full day as our snow day, that we would have the time or the energy to also carve our pumpkin. But we did. We bought the pumpkin several weeks ago at the Punkin' Chunkin' festival - our first snow day of the season. But it has been so warm since then, we put off carving the pumpkin. No use having it start to rot and look like a grandpa Jack-o-Lantern before Halloween! So here we were, less than a week before Halloween. Even if it hadn't snowed we probably would have carved the pumpkin just because time was running out! The "Pickles" have been going back and forth about what kind of pumpkin we should carve. 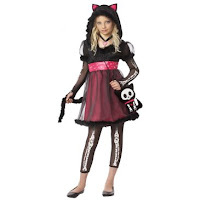 The Girl wanted a vampire or were wolf. The Boy wanted a pirate. Neither would budge a bit. That's how it was when the evening of carving came. So instead of sitting around undecided, I drew a face on the pumpkin and that's what we carved. Neither child had a problem with it. and as usual, The Girl was really more interested in the goop than anything else. We wound up with a pretty neat looking pumpkin! Although, since it has fangs like the vampire The Girl wanted, I guess I need to put an eye patch on it, too...just to be fair to The Boy. I've got to give credit to the weather forecasters. This time, they got it right! At least a week ago, predictions for 1-2 inches of snow were being cast around. Then on Monday (during a record breaking 80 degree day) the forecasts were predicting 5 to 7 inches of the white stuff to fall throughout Wednesday. I was still skeptical since the forecasts are usually pretty off around here, but we decided to have fun with it. Mr. LH took a "poll" to see how much snow each of us thought we would receive. I guessed 2 inches. The Girl guessed 8" then once the snow was late in starting she changed it to 5". Unfortunately, even though the "Pickles'" school district was out on Fall Break, Mr. LH still had classes going on so he headed out in the morning with snow still falling all around. Soon after, I was awakened by 2 children running into my room and opening the blinds telling me to "LOOK! LOOK!" There must have been about 4 inches of snow covering everything already. It was beautiful! The trees still had their fall foliage, their brilliant colors popping against the bright white of the snow. A couple cups of coffee later, I felt awake enough to let the "Pickles" venture outside. I asked them to help to shake the snow off the tree branches and they were more than happy to do it (provided I let them stand directly under the falling snow). and a little sledding in the neighbor's front yard. We stopped for a moment to measure the snow at noon (6 inches and still more coming down). After a round of hot chocolate, it was back outside to take turns getting buried in the snow. for some GREAT sledding down a much bigger hill! By then, Mr. LH was able to join us and took a turn on the sled. We were thoroughly chilled to the bone and very happy. We headed back home for some warming Beef Stew and fresh baked bread (and some pumpkin carving). The Girl proclaimed the day "The best day ever." Surprisingly, even with the hot dry air, our paper mache took longer than 24 hours to dry, but it finally did. Instead of doing a second layer of paper strips as I had planned (it was SO messy), I decided to try to make a pulp to sculpt over our forms. I soaked some of our remaining newspaper strips and then dumped it all into my blender with additional water. Once the newspapers became a gray mass of pulpy mess, The Girl and I strained it, squeezed out any additional water and then mixed it into our leftover flour and water paste. I kept hoping there was enough paste to hold the paper pulp together. I thought since you only use paper pulp in making homemade paper (no paste) and homemade paper tends to be fairly strong, we shouldn't need too much paste. We probably had about 1 1/2 cups of paste left over from yesterday but once it was mixed in well with the pulp, you couldn't tell there was any paste at all! In fact, with the new "pulp clay" there was hardly any mess at all. We pulled out small clumps of the new "pulp clay", squeezed out any remaining water into another bowl and pressed the clay all around our forms. It was very easy to work with. You can see in the photo that The Girl's hands are MUCH cleaner using this process than they were yesterday using the newspaper strips and paste. It didn't take long for our forms to be completely covered with a decent layer of the "pulp clay". I love how The Girl's wolf looks more and more like a wolf. My pumpkin still looks more like a cartoony bomb. I guess once it's finished, the orange paint will help it look like a pumpkin. Since the weather forecast was calling for rain and snow this afternoon, I opted to set the oven to 175 degrees and placed the sculptures on the bottom rack to dry. Even with the forms in the oven, it was taking a long time to dry. We would have to plan to paint them another day. I haven't made anything with paper-mache (Papier-mâché ) in many many years but when I came across this fabulous life-sized paper mache Jack Skellington (and my family is all about Jack), the creative juices started flowing. A few days later, the "Pickles" started their fall break and not far into their first day of their break, The Girl became "bored". It was a perfect time to introduce her to paper-mache. The first time I remember making something out of paper-mache, I was in elementary school. We covered a balloon with strips of newspaper and a flour and water paste. A couple years later, while I was participating in a summer theater program at the public library, we made costumes with paper-mache heads using the same process and attached long, flowing fabrics for the costumes. We would attempt something similar but since I had no balloons, I decided we'd create our base using crumpled newspaper secured with tape. I emptied our newspaper recycling bin and The Girl and I started tearing numerous strips of paper. In the middle of our tearing, the girl next door came by looking for a playmate. Having never done paper-mache herself, she joined in. It's pretty fun to sit around on a kitchen floor ripping up newspapers! I showed the girls how to create their base sculpture. I was going to make a simple pumpkin. The Girl (taking after her mother) wanted to jump right in to something more elaborate - a werewolf head. While they struggled with the crumpled newspaper and tape making their forms, I mixed up a simple paste of flour and water. Not too thick and not too thin - more like pancake batter. We put on some aprons and went outside with our base forms, our "paste" and our huge tub full of newspaper strips. I demonstrated how to coat the newspaper strips with paste and wrap the forms. The mess began. We all wound up with flour paste caked on our hands. Newspaper strips stuck wherever the paste was. The Girl would shake her hands trying to get the strips off and in the process had flour paste flinging from her fingers into my hair and on her clothes. We did manage to get some newspaper and paste on our sculptures. Once we finally took a break to let the pieces dry before adding another layer, we stood up to wash our hands under the outdoor water spigot and saw there was more paste all over the patio than anywhere else. Thankfully, it could be easily removed with the water hose. After we got a good coating of newspaper and paste on the sculptures, we left them out in the (still very hot) sun to dry. The Girl's werewolf looked more like a wolf than I had originally thought it would. She must have an eye for this sort of thing (grin). The pumpkins still looked like small cartoon bombs, but hopefully they'll take shape after another coating of paper and paste.